Last week, after I uploaded that picture of me sporting a dorky bowl-cut, I also updated my Facebook profile with the picture. I haven’t named him, but if he wants to come here and claim his fame, please do! This picture mirrors the paradigm of our relationship — he was always ‘the bottom’. I would do the pushing around; he would always do my bidding. This post about my childhood should provide some good background reading for my About page; it will explain my motivations behind what makes me tick today. Sadly, I’m just kidding. My cousin is 10 months my senior and from what I’m told, I used to follow him around and do whatever he did. That’s why I love that picture so much; it shows that even at a young age, even with kids older and stronger than me, I was developing leadership skills that were to see me to be forever… mounted. I guess, even when I was just a few years old, I had a charisma that could enable me to get away with just about anything. My childhood is full of stories of me doing crazy things and getting away with it. Until I was 2 or 3, we lived on the premises of a school (my mum was a teacher). When I was 2, I took the keys to a school bus (from the main office), walked outside, climbed into the bus and started it up. I also used to go walking… walking for a long time. Into the woods, around the out buildings. I assume there were people keeping an eye on me, but I really don’t remember! I’m told I would go and talk to the grounds keepers, or mechanics. I was highly inquisitive as a child, and I’ve certainly kept that trait as I’ve grown up. I like to refer to these first 3 years as ‘the age of mobility‘, as it was the only time in my life where I was so active that it was actually troublesome for my parents to keep up with me. I slowed down a lot once I discovered computers — but computers just gave me access to millions of other people to work into a stupor through sheer charismatic enthrall. Now have a completely random and adorable black and white picture of me from a photo booth. Aged 1 or 2 I guess — the next frame is of my mother, but I haven’t included it, as I should probably ask her first! 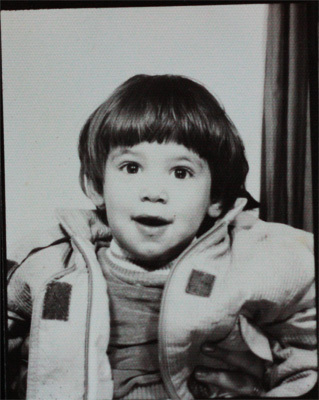 I was incredibly inquisitive as a child, often to a fault. That I disassembled over 10 video machines as a child is a fact my mother likes to remind me of on a regular basis. I remember sliding my sandwich into the hole, and then taking the machine apart to find out why the sandwich had stopped it from working. Later, as I became brighter, I would take them apart just try and work out what each bit did. I located and interrogated the capacitors, the integrated circuits, the magnets. While I stopped destroying video machines after a few years, I’m probably still the best person to ask for help if you have a faulty one (but I don’t think anyone has one any more, do they?) Maybe I should ask my mum if I can take apart the DVD player… or three. When I wasn’t at home taking apart radios, washing machines and video players, I would be asking why? every 30 seconds. In the car, in my pram, walking — Why mummy? Why is it like that? That trait still plagues me today, although my knowledge of the world is so vast now that asking why? rarely rewards me with an answer. Now I have to find out things for myself; I have to tear down reality and poke around at the mechanics of the world — and people — to find out the answers I so desperately need. That’s the main reason I travel: to see new environments and new cultures. I won’t be content until I know what makes everyone tick. It’s that kind of general knowledge that draws people to me for advice, and why I’m often considered wise. A lot of people today are quite happy just to accept things they see and experience as given. When they ask Why? they are content with an answer of Because. I couldn’t imagine living in a world where everything happens just because. Cars whiz by, planes roar overhead and data is transferred across the span of the world at the speed of light — don’t you want to know how it happens? I guess the next update on my childhood has to be of my teenage years… Maybe I can just get away with a crappy picture of me as a teenager, and leave it at that. Hmm. You have a very mucky face. It’s probably just dirt on the photo…! But I am licking/eating my fingers, so I was probably eating something nice just before the photo was taken! 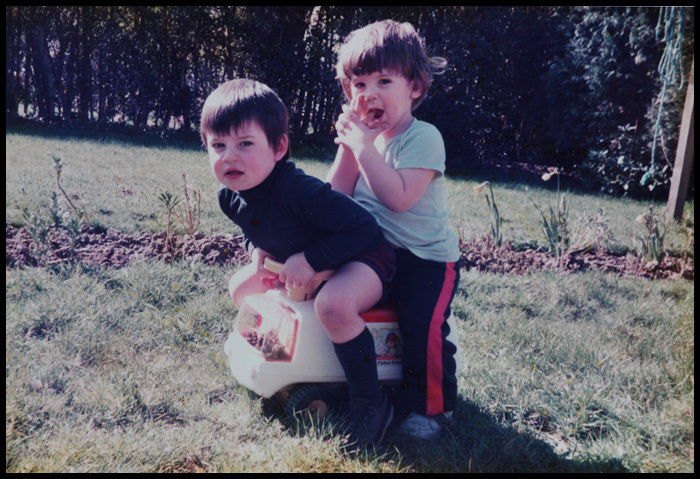 Looking at some of my other childhood photos I was quite a messy eater though… but wasn’t everyone?! Don’t tell me, you used a knife and fork perfectly from the age of 18 months? Andhari; you can’t adopt me… you’d look silly, walking around with a son twice your height! You and I both know you’re not kidding…! Aww you were super cute! I can’t believe you stuck your sandwich in a video machine. Did you get in trouble? VCR’s were around $800 when I was a kid. That’s a very good question… No, I never got in trouble. I was always encouraged to be inquisitive, which is why I believe nurture is so damn important. Ummm, “he was always the bottom.” Do we need to discuss the homosexual undertones in that line? We are very close cousin! P.S. Does this mean you now know everything there is to know? I find that hard to believe, somehow…. No, you can never know everything there is to know! The single greatest barrier to learning new things is to assume you already know it! In short: I love learning new things. Really? I could? Can I dress you in a tutu? I think I should be allowed to express myself as much as a girl…! Girls aren’t frowned at for wearing jeans; I should be allowed to wear a tutu if I feel like it! At a guess that’d be your first cousin…? We lived in a court with a school at the end when I was a kid. We used to play there all the time. unsupervised. The kind of thing that would never happen today I’m sure, especially when they were renovating the building and we would go crawling around in the tiny crawl spaces. Ditto for the creek where we used to hang out, ride our bikes, and I’d walk the dog. There’s a lot to be said about what we let our kids do nowadays. There have been numerous reports that there’s just as many predators today as there were ‘back in the day’ (whatever age gone by that people are inevitably referencing). Damn the media; damn their over-reporting of problems that may or may not be there! I wish we had creeks in England! Did you deliberately reduce the contrast on those images to make them look older? No, they’re just that faded — think the first one was on display in the living room for some years. Second one is probably just faded because it was done in a photo booth, so not the most long-lasting developing process! I thought about making them more contrasty actually… but that’d be offensive!! I have to say it, awwwwww so cute. adorable! Being a celebrity, Chele, you might even have danced the night away with his father… maybe! dude, you were a stud. Yes… boyish charm… when I was a _boy_. Now I am big and hairy and totally UNCHARMING. Unless it’s an American, then I can get by with just my accent. Phew.